Hmmm...San Francisco appears to be on my mind today. Boy I miss that city. Sometimes I just crave the sound of the bus cruising below my Lombard St. apartment every 9 minutes...not to mention the 75 degree days in the middle of January! So, it looks like a new attraction is on the horizon...on NPR yesterday I heard about a new museum heading to San Francisco--the Presidio actually. 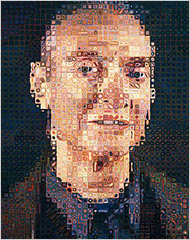 Apparently the Fishers, founders of Gap, Inc., will be spearheading the museum, which will be home to their own collection (including the Chuck Close pictured) and many other contemporary pieces. It should be a nice complement to the MOMA and the Legion of Honor.